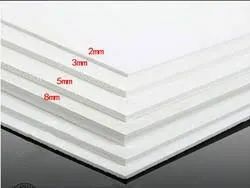 We are a well-known trader, importer, supplier, distributor and wholesaler of a wide array of PVC Foam Boards. These machines are manufactured using optimum quality raw material and latest techniques at vendor's premises. Our products are widely demanded for their features like non-toxicity, easy installation, corrosion resistance, ability to withstand harsh weather conditions, minimum maintenance, longer service life and chemical resistance. Due to these features, our products are used as display sign boards, partitions, air conditioning ducts, wall cladding and many more. We are among the leading industries engaged in manufacturing, supplying and exporting a premium quality range of PVC Foam Boards. These boards are in huge demand these days for their high performance and reasonable rates. The product has various applications in different fields and can also be customized in accordance with the needs and demands of the customers.